Consumer electronics product lifecycle management is often challenging for most vendors, but it's particularly problematic when customer needs and wants are constantly changing. Such is the case with media tablet users around the globe. As the market matured, distinct customer use case segments evolved. Worldwide media tablet shipments, inclusive of slates and detachables, reached 38.7 million in the second quarter of 2016 (2Q16) according to the latest global market study by International Data Corporation (IDC). Growth continues to decline with the market receding 12.3 percent year-over-year as vendors begin to refocus their product lines and consumers wait on purchases. An overwhelming majority of tablets shipped this past quarter were Google Android-based systems (65 percent) followed by Apple iOS, which captured 26 percent, and Microsoft Windows for the remaining share. Though this trend has been constant for years there are early signs of change as the Android vendor list has contracted and champions of the OS have begun to offer Windows-based products, hedging against the decline of Android slates. "The market has spoken as consumers and enterprises seek more productive form factors and operating systems – it's the reason we're seeing continued growth in detachables," said Jitesh Ubrani, senior research analyst at IDC. It's difficult for Android to compete with iOS or Windows detachable products. However, the next 12 to 18 months will be very interesting as Google launches the next version of Android with better multi-tasking support and as they begin to bring together their two operating systems (Chrome is the other OS). Despite the continued decline in slates, the form factor still accounts for over three-quarters of the market. While growth in the detachable category is undeniable, slates continue to represent the vast majority of the segment. 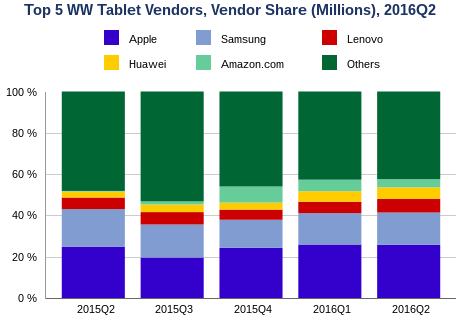 Vendors such as Amazon -- with a very focused approach to positioning, price, and purpose -- managed to capture a considerable share of the tablet market. According to the IDC assessment, slate sales are declining but they still serve a purpose and will do so for a long time to come. Apple's launch of its second detachable tablet helped lessen its year-over-year market share decline to 9 percent, but more importantly it helped to raise Apple's average selling price (ASP) and revenue. Meanwhile, Apple continues to struggle with sales goals across its aging consumer product portfolio. Price reductions on previous generation iPads and the latest Pro iterations are expected to have the same effect for the remainder of 2016, as the consumer and enterprise customer bases evaluate their ongoing needs and wants.